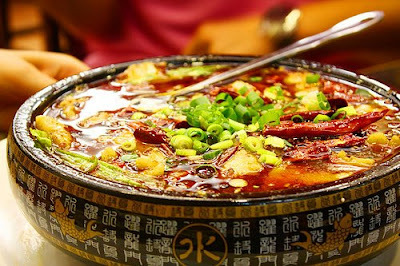 Spiced fish stew, in strict sense, is originted from Sichuan cruisine, but now it's really been a fashion trend in our city here to eat spiced fish stew. Its flavour is a bit spicy and not so mild, but for the sake of it's great smell and taste, just putting those healthy related talks beside me for a second, because I want to taste happiness with the smoothy fish slices. 1, Rinse the fish fillets and cut each into 3 pieces. Dry the fish well with a clean kitchen cloth. Combine the fish with the marinade in a large bowl and set aside for about 30 minutes. 2, Prepare the salad base in a bowl.Heat up some oil in a wok or heavy skillet and slowly stir in the marinated fish. Cook until fish just starts to turn white, about 2 minutes. Transfer to a paper towel-lined plate to drain.Pour off the frying oil, leaving about 2 tablespoons in the pan. Add in hot bean sauce and stir until fragrant. 3, Stir in ginger, garlic, half scallion sections, chilli flakes, half of each Sichuan peppercorns and dried chilli. Stir over the medium heat until their fragrance is fully released. Drizzle in rice wine and light soya sauce. Continue stirring. Pour in stock, adjusting the heat to high, and bring to a boil. Season it with pepper, salt, chicken powder and white sugar. Return fish to the skillet and cook for about 3 minutes. 4, Turn off the heat and pour the fish stew into the prepared bowl with salad.Heat up 200 grams of oil in another pan. Add in another half peppercorns and dried chilli. Stir till fragrant over the slow heat. Pour over the fish and garnish with the curled, drained spring onions or coriander leaves. 1. Please do not eat the dry chili pepper and flower pepper. It is just for the flavor. 2. Serving with a bowl of white rice can reduce the spicy for you if this dish is so spicy for you.